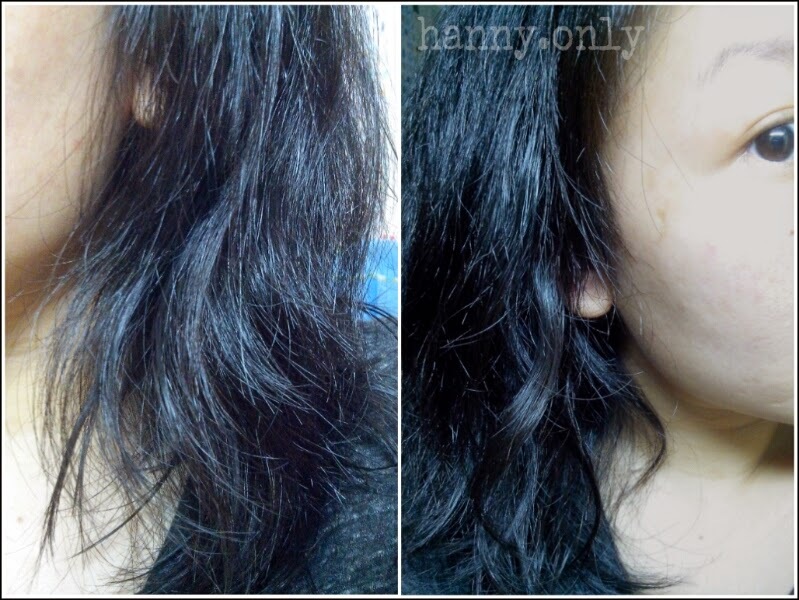 hanny.only: Healthy Hair 101! - SILICONE AWARENESS.. Healthy Hair 101! - SILICONE AWARENESS.. This going to be a longgg post! But it's educative for your own good.. be patient and read. It's worth it! When it comes to health, there's no such thing as "shortcuts". We need to be patience and eager to fight for our health. And for women (and man, of course), not only slim waist, washboard abs and firm arm that counts, hair also take a good part to perfecting our look. There're so many hair products out there claimed to be the best in solving our hair problems. One of them that is definitely ruthless, it's called frizzy hair. I'm dealing with this problem since my teenage years. Yes, it was more than a decade ago, but yet i'm still struggling to fight for it. Unlike pimples that could be disappeared when you're mature enough (unless you have an adult acne, sorry!). But now i fight it in the right way, and not the short way. One thing you need for sure is AWARENESS. Please be aware about what you wear. Take time to read the ingredients list on the back of your hair products. Does it contains Silicones? If it does, please read this article and educate yourself. Because that's the key ingredient that makes you wonder, why with all of those products (shampoo, conditioners, masks, serum, oils and so on), my hair is still as crisps as an angel hair pasta. Haha. Silicones ends in CONE , COL, CONOL or ZANE, such as dimethicone. It does makes your hair feels smooth and manageable instantly, but you know, it actually layered your hair with some sort of film and blocked all the moisture that your hair needed in daily basis. And each time you put silicone onto your hair, it'll cause build ups. I, honestly, just found out about this fact recently and pretty shook up. Geez! Those awesome advertising about how they could repair and restore my hair, and it's just a lie. Man, i'm broken hearted. So there are several types of silicones. Water soluble silicones will not cause build-up. Get yourself a good clarifying shampoo and use it at least once a week to rid your hair of any silicone product build-up. Be sure that if you use silicones often and also a clarifying shampoo that you follow-up with a deep conditioner. Clarifying shampoos strip the hair of all product as well as natural oils. Using a clarifying shampoo too often will dry out your hair, but curls do tend to take better to product after a clarifying shampoo. For some women, using a shampoo containing cocamidopropylbetaine is enough to rid their hair of silicones, so if you use silicones often, try a shampoo with the ingredient to see if you can avoid clarifying altogether. 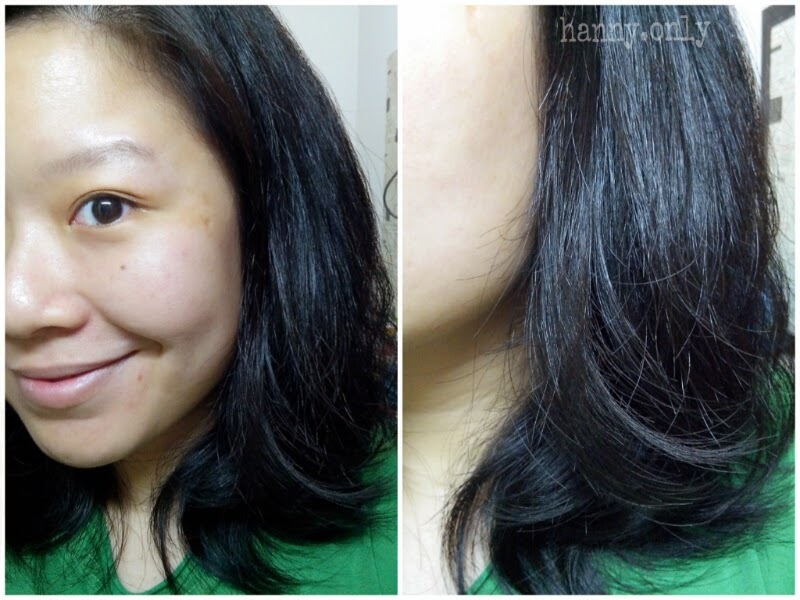 Ok, since few weeks ago, i changed my hair care routine regime. I went to a drugstore nearby to find an option of clarifying shampoo and conditioner that's made from natural ingredients and free of silicones. While searching, i found out that even my baby Clav's shampoo got silicone in it. What the?! How disappointing! And the third number ingredient listed is PERFUME. Gosh! Baby products are more damaging than adult's. And, sadly, the natural and save ones are so expensive because they were imported from far far away. Another disappointment, come on local brands, do something! 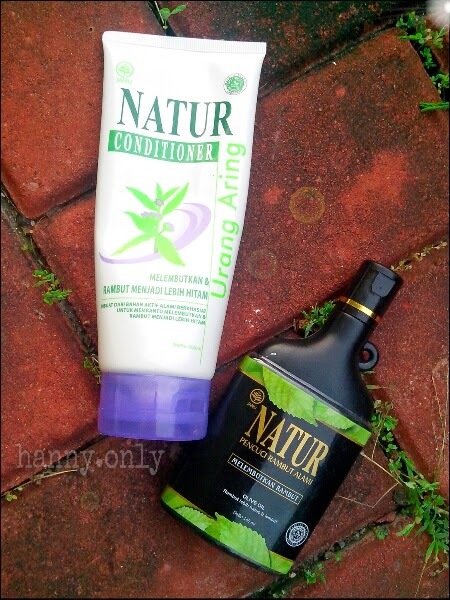 Ok, so after i went to several drugstore in a hope to find a product that suit my needs but also suit my pocket (haha..), i ended up trying Natur shampoo. It claimed to be natural (well, it's the name, actually) and contain no silicone, colorings and anything that we don't need. This shampoo used to have the unique scent, more like a herbal medication ones due to it's natural aspects. But now it has this nice green tea scent that's so nice. But i wonder though. 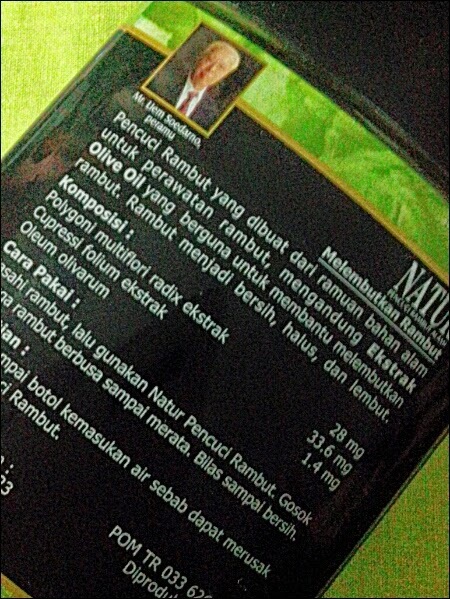 It sez on the brochure inside the package that they use natural green tea fragrance but it doesn't mentioned in the ingredients list. 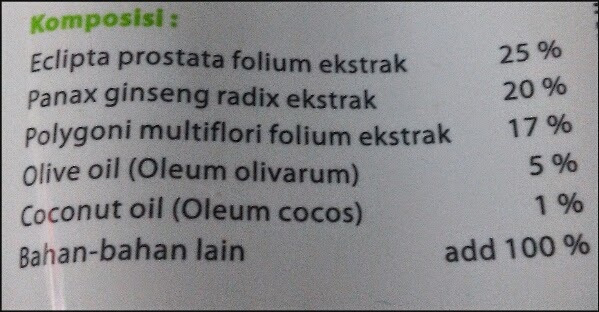 Or it just me, i don't speak latin..
Well, i am curious about the "other ingredients". I tried to email them few weeks ago to asked about it yet there's still no reply until today. Hmm! I already finished my first batch of shampoo and conditioner as we speak. At first my hair felt so light and my scalp felt sooo fresh. Gosh! So many years of silicone build ups. You have no idea how heavy it is on your head until you set them loose. Haha. 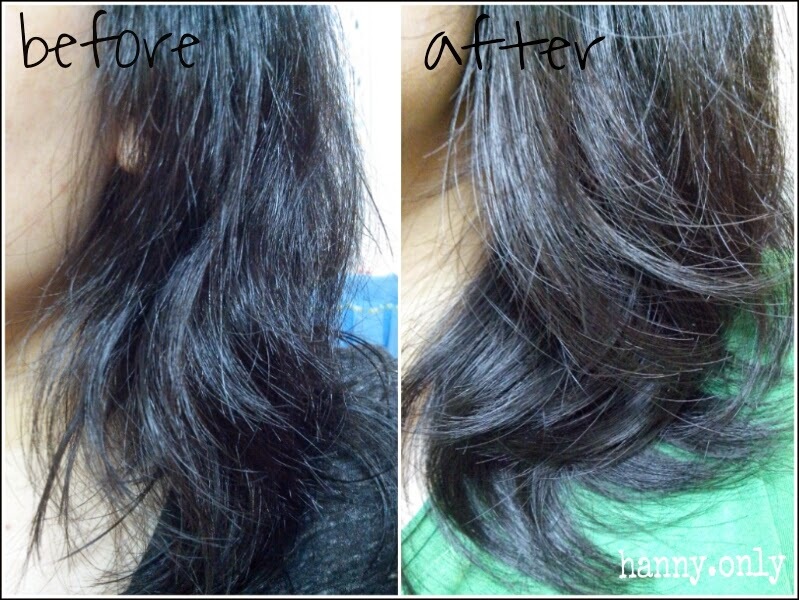 After almost a week usage, my hair felt so dry. More like a fresh clean grease-free plate. I think that's when i need help from hair oil, and i use Cem Ceman Oil from Mustika Ratu as my hair serum and started to wash my hair every other day. And that's a huge difference. Before, i have to washed my hair everyday, even twice a day. I cannot stand the oily and itch. But after using non-silicone shampoo, my hair could stand it. Amazing! Got this pic from google, i forgot to take pic of mine (i threw it after re-deposit). i hate the cap, it's better if you place it in a pump bottle. Easier to take out the product, since you just need a teeny bit. PS : use hair oil / serum that contains NO-SILICONE as well, alright! 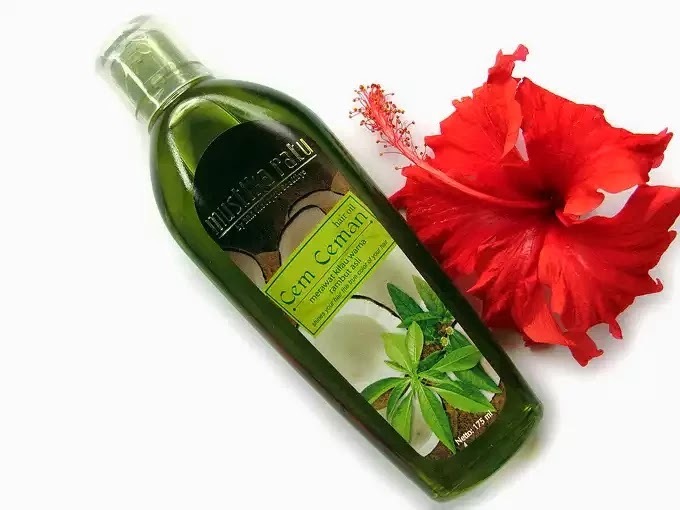 Sometimes, when the heat it's too much and i cannot bear, i just washed my hair with the conditioner only, or put the cem ceman oil on hair strands and washed my scalp gently with the shampoo. The oil acted as protecting layer so my hair ends won't be as dry. Because you know, the ends of your hair get the least of natural oils. So you need to add them, unless you want to have dead ends. Nooo! So after about couple of weeks usage, i do feel the difference. Hair is more light and my scalp is less oily. But if you washed your hair too often with silicone-free shampoo, it will strip away your natural oil and leave 'em dry and itchy. So make sure to wash your hair less. Once every two or three days helps. Don't forget the conditioner and oil afterwards. O yeah and make sure to only towel-dry your hair by pressing it gently and not by rubbing it against each other, ok! And always brush your hair (while damp) from below then move upwards to the roots, it prevent more hair loss caused by breakage. Lastly, i just wanna say that i don't 100% make enemy with silicones. Sometimes on the weekend when i have to go out to the party and all, i use silicone based products to simply make my hair look gorgeous instantly. But afterwards, i use the clarifying shampoo to cleanse all the residue. But maybe in the future, i will have healthier hair so then i could completely free from silicones forever and ever. Amen!